- Saltwater (Akoya) pearls come from oysters inhabiting the oceans of the world, predominantly Japan. - Considered the most beautiful and lustrous pearls in the world. Aloya pearls are prized for their perfect roundness and mirror-like luster. - Akoya pearls are the classic pearl. They are the traditional type of pearl most people think of brides wearing on their wedding day. - Akoya pearls are grown in the oysters and named after the oyster in which they are grown, whose scientific name is Pinctada fucata martensii. - Cultivated for quality, they are usually harvested one pearl per oyster; therefore they are rarer than their freshwater counterparts. - The Akoya oyster is not especially large, typically producing pearls ranging from 2-8mm and occasionally found in sizes up to 10mm. - Saltwater (Akoya) pearls are bead-nucleated which begins with a rounded, polished piece of mother-of-pearl shell which is embedded into the mollusk along with a piece of mantle tissue. Over time, the mollusk secretes a coating called nacre around the nucleus. - Grown primarily in man-made lakes and reservoirs in China. - Freshwater pearls are nucleated by inserting a small piece of mantle tissue from the mollusk between the mother-of-pearl linings of the host mollusk. - Grown in mussels called the Hyriopsis cumingi. - Produced in large quantities. Freshwater pearls can be cultivated to produce up to 50 pearls per mussel which makes them abundantly available. - Freshwater pearls, while attractive, typically do not achieve the same luster or roundness as saltwater pearls. - Pearls produced early on were mostly rice shaped. Later, potato shapes were produced and more recently near-round to round. - Freshwater pearls can be cultivated to produce larger sizes than saltwater. Today they can be found in sizes 12mm and larger. 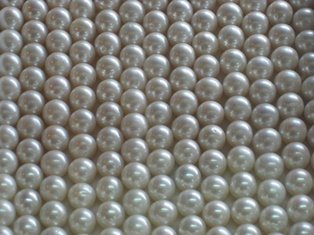 If you are looking for a classic pearl, look to the Akoya pearls: round, creamy, lustrous with a deep rich inner glow, Akoya pearls are considered among the finest and most popular in the world. Add-A-Pearl uses Akoya pearls. But, if you are looking for affordable pearls, freshwater pearls are the gift of value of the pearl family. Learn more: What's the Difference Between Natural and Cultured Pearls?